Eighth place in this weekend’s 4 Hours of Le Castellet – round four of the European Le Mans Series – was a satisfying outcome for the Murphy Prototypes endurance racing team. The performance by all three of its drivers: John Coleman (England), Kevin Ceccon (Italy) and Seán Doyle (Ireland), as well as the reliability of the car, signalled that with a little more good fortune, the result could have easily been even more impressive. Prior to the race at the Paul Ricard Circuit, the team confirmed that it was continuing with its programme of showcasing up-and coming talent this season. For the first time, the scheme included 22-year old Kevin Ceccon and whilst an experienced single-seater driver, this would be the Italian’s first ever race in a prototype sportcar He later announced that he was regarding it as a springboard towards his endurance racing career. 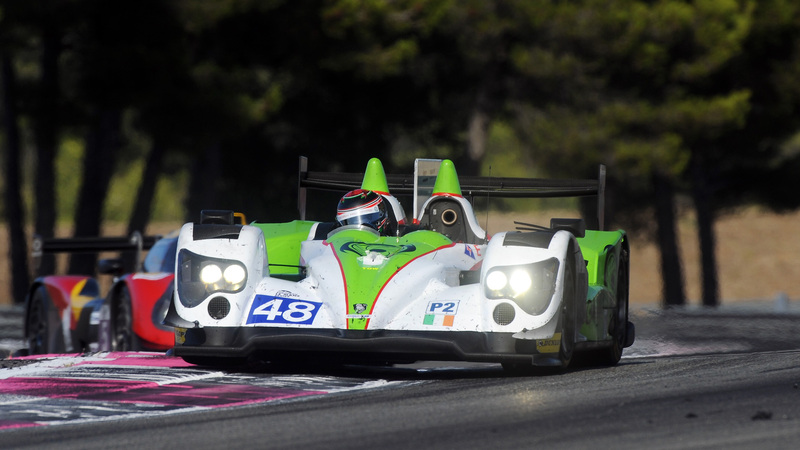 Continuing to benefit from the scheme, Seán Doyle – also 22 – is the only driver out of the trio to have raced the team’s LMP2 Oreca 03R before, whereas Jonathan Coleman is already an experienced sportscar driver and had competed in the ELMS earlier this season. And whilst he tested with Murphy Prototypes previously, this would be Coleman’s first competitive outing with the team. Not withstanding that this weekend was his debut in an LMP car, an impressive performance in Saturday morning’s Free Practice session meant that Ceccon was nominated to drive in qualifying, the young Italian affirming the team’s decision by posting the sixth-fastest time. In keeping with the week leading up to the event, a cloudless sky greeted teams on Sunday morning, meaning that conditions would be hot and dry for the race – a first for this year’s ELMS. Coleman was chosen to drive the first stint. A clean start, followed by some evasive action in order to keep out of trouble in the first sequence of corners, meant the Englishman emerged in ninth place at the end of the first lap. A consistent performance and not putting a foot wrong for the whole of his 40-minute stint saw Coleman make the team’s first scheduled pit stop to change drivers having held onto ninth. A small issue installing Ceccon into the car, caused the stop to take a little longer than expected and he joined the race in 11th place. He quickly dialled himself in and, after just a few laps Ceccon’s times were matching those of the top three drivers in the race. After making up some of the deficit, an efficient second scheduled pit stop by the team combined with the Italian’s good work, meant that when he embarked on the second half of his double-stint, he was up to eighth. Although gaining on the cars ahead, Ceccon was unable to get close enough to make up any places and, following an inspired drive, he ended his shift exactly as scheduled with 90-minutes of the race remaining. A perfectly executed stop for fuel, tyres and for Doyle to take over driving duties enabled the young Irishman to join the race and remain in eighth place. After getting to grips with a new set of tyres, Doyle soon settled into his rhythm and whilst he did all he could to improve the position, consolidation was to be the order of the day. And that’s exactly what he did. With the car not missing a beat and after impressive showings by all three drivers, the team came away from the event satisfied in the knowledge that the outcome of the weekend was closer to where it should be in terms of performance. The team now looks towards the fifth round of the European Le Mans Series that takes place at Spa on 25th September.